With Snapshot (read committed snapshot and snapshot isolation level) enabled, when data reading on a table takes place, if any records are being modified at the same time, the data will be read from the rows in version store rather than wait until data modification complete. Such behavior lets prgrammers think that reader process will NEVER ever be blocked by writer process. In most of the scenario, this is correct, however, when reader process is indirectly issued and running against a table, the isolation level for that reader process is always read committed lock isolation regardless the transacitoin isolation level of the parent statement. When will the reader be indirectly issued? This happens when FK data verification are taken place. Let’s say there is a child table referencing to a parent table. When the FK column in child table is modified, the data modification process will have to lookup the parent table to ensure the existance of the parent record. In this case, when the parent record in the state of being modified, what would happen? Will the values in the version store of the parent record being used? Another way around, when the referenced key in the parent record is being modified, SQL Server will have to ensure there is no record in the child table referencing the key value. Such verification process will use read committed lock transaction isolation level. I inserted 3 values into the parent table and 2 record into child table. Then I update parent id 20 (see below) and keep the transaction open. In this case, the row with pid=20 is locked by X lock. This process will wait. This sometime is very confusing — 2 sessions are operating on 2 different tables, why blocks are generated? Let rollback the transaction in the first session. The update statement will be completed. Aha, the second session is blocked. This sympton is as confusing as previous example — both statements are operating at different objects but the second one is always blocked. The reason behind is the Foreign Key between 2 tables. In the first example, when the second query runs, the foreign key pid in table c is changed, SQL Server will have to go to the parent table to check the existance of the pid=20. Record pid = 20 in the parent is locked by the first session in which it prevents the session from accessing the record, then the second session will have to wait until the lock held by the first session releases. You could use read committed snapshot and snapshot isolation level to re-run those 2 test. The results will be the same. 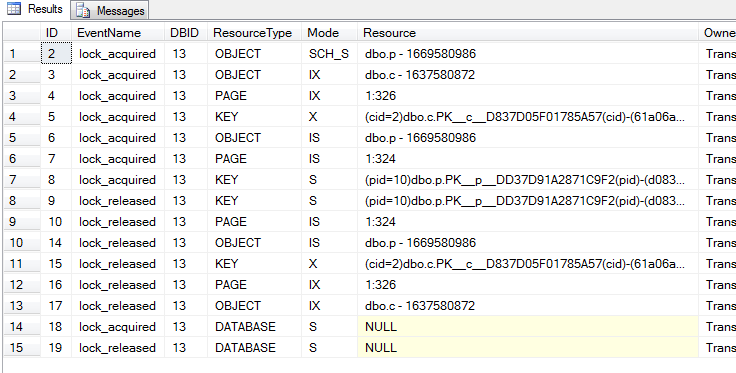 Well, that’s true that SQL Server has to guarantee the data consistancy between parent and child tables. Any parent records not in committed state can not be referenced and vise versa any child records not in committed state can not prove that refereced keys are used. 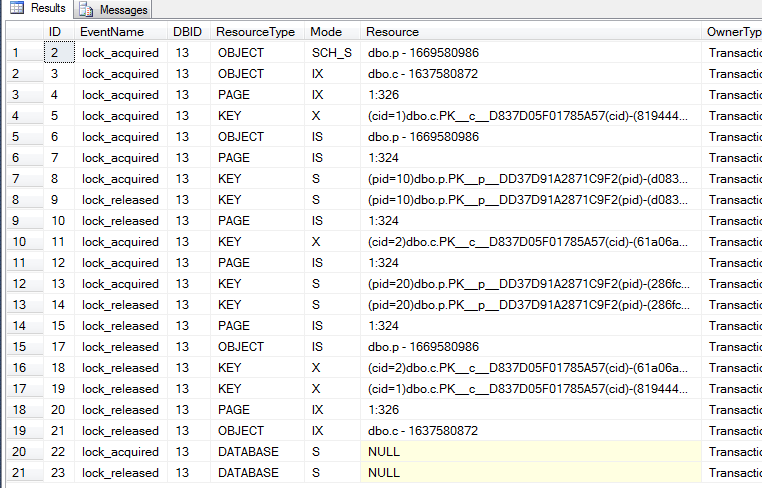 From 2 examples above, you can see that there are indirect data reading processes involved for data integrity check. You may be curious why I say the indirect reading processes are under read committed lock transaction isolation level. In order to prove it, I am going to use Extended Event to collect the locking behavior of such situations. Look at the rest of the rows in the result, the Event Names are lock_release. Those means transaction is completed. All the locks are released. Well, this still not be able to explain why the in-direct reader process is under read committed lock transaction isolation level. It’s not conclusive because there is only one record in the parent table needed to be verified. If we update multiple records in the child table with more keys to be varified in the parent table, it would become more conclusive. You can see that within the transaction, while the parent records are being checked, pid = 10 in the parent is locked with Shared Lock and released afterward, then pid = 20 in the parent table is locked again and released. This is the typical locking behavior under read committed locked transaction isolation level. CREATE ASSEMBLY for assembly ‘Delay’ failed because assembly ‘Delay’ is not authorized for PERMISSION_SET = UNSAFE. The assembly is authorized when either of the following is true: the database owner (DBO) has UNSAFE ASSEMBLY permission and the database has the TRUSTWORTHY database property on; or the assembly is signed with a certificate or an asymmetric key that has a corresponding login with UNSAFE ASSEMBLY permission. Guess the script somehow corrupted when copy& paste via IE, any chance that I can get the script via mail ? Hi Jynn, before deploying the assembly, you should have trustwrothy flag on the database on. this should helpout. Please let me know if any questions. really helpful and answered some questions i had on sql server’s behavior when read committed snapshot is enabled. thanks so much!